Buy Southern Draw Cedrus Online! Sitting atop the growing collection of cigars in Southern Draw Cigars' beloved portfolio is the uniquely packaged Cedrus. The cigars first debuted in the summer of 2018 and are billed as the company’s most diverse blend to date, being meticulously developed for over five years before the cigar's eventual release! Like all Southern Draw (SD) cigars, Cedrus draws inspiration from three areas: a) faith, b) family, and c) nature/florals. As such, the name represents the Lebanese Cedar trees used to build Holy temples. 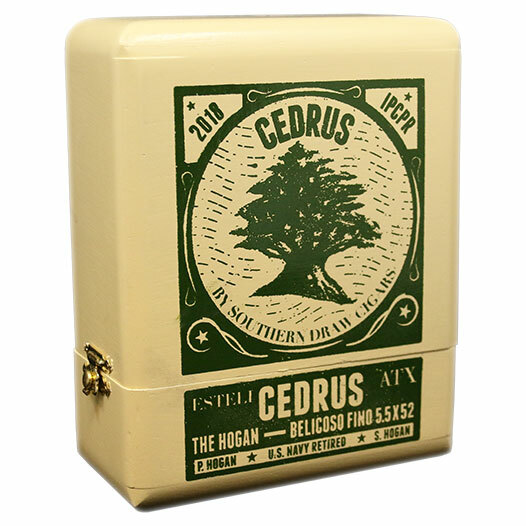 Additionally, Cedrus draws from the Western Red Cedar known as “the Hogan,” simultaneously honoring the Hogan family—close friends of the Southern Draw family. Southern Draw Cedrus is rolled in small batches at the famed A.J. Fernández factory in Estelí, featuring a skillfully rolled box-pressed Belicoso Fino shape. This unique size is then packaged vertically in canisters somewhat reminiscent of an ammo can (SD being a military-focused company). But it's the cigar's highly specific blend that truly shines, offering a combination of Nicaraguan and Dominican tobaccos in the cigar's filler (including a specially selected leaf from the uncommon Nicaraguan region of Quilalí). The standout filler blend is then bound in Nicaraguan Habano 2000 and finalized in a unique Indonesian Besuki wrapper. The finished product is one of the most special experiences from Southern Draw to date, offering enthusiasts a steady progression of intense flavor from start to finish. Expect a medium body and layered flavors of pepper, leather, tanginess, heavy cedar (naturally), and dark chocolate.